Step machines, or stair climbers, are a popular alternative option for the well-knows steppers. They work on a simple basis – the user walks essentially in place, using stairs revolving inside a frame with safety rails. 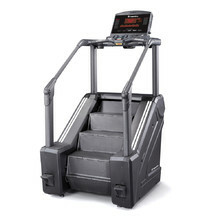 Sixty minutes of intensive training on a stair climber will help an 80-kg person burn approximately 735 kcal. Regular intense training usually has positive effect on your blood pressure, cholesterol levels and heart activity. This makes step climbers one of the most sought-after cardio trainers.